The second edition of the Twenty First Century Science resources has been developed in partnership with OCR, the University of York Science Education Group and the Nuffield Foundation. They have been fully updated to match the new 2011 specifications. The second edition builds on the success of this hugely popular suite of resources. With extensive feedback from schools and teachers using the resources, the new suite provides ideal support for the 2011 specifications. There is now more help with exam preparation and assessment throughout the course and more differentiation to aid learning for all abilities. There is greater customisability using the latest digital support and it's packed with new scientific contexts reflecting the latest research and ideas. 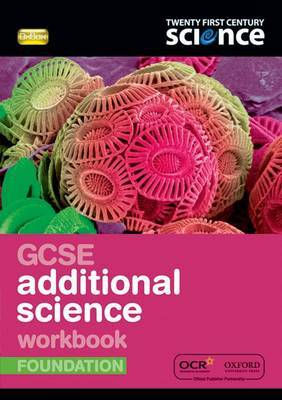 The GCSE Additional Science Foundation Workbook can be used to help consolidate students' learning through engaging activities. It's flexible as it can be used both at home and in the classroom, and is packed with activities that support the Student Book. The content is engaging and lively, ensuring up-to-date science is blended with engaging topic themes.